Historian Ric Hajovsky Expounds on the Birth of an Industry….. 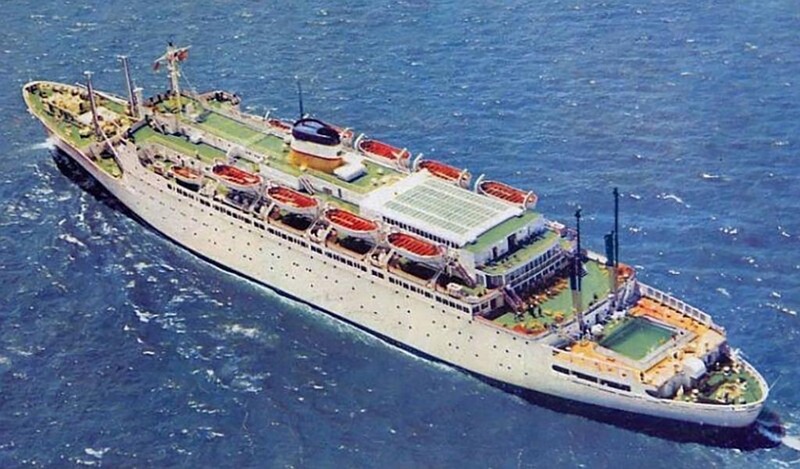 The SS Ariadne departed Miami on November 3, 1967 to become the first cruise ship to call regularly on Cozumel. Cozumeleño Carlos Namur Aguilar was the ship’s agent on the island and he received the ship on its arrival in Cozumel on Sunday morning, November 5, 1967. The 239-passenger ship was built in 1951 as a ferry to travel between Gothenburg and London and was launched as the SS Patricia. Eastern Shipping Corporation (owned by W.R. Lovett, the owner of the Winn-Dixie supermarket chain) bought the ship and renamed her SS Ariadne. 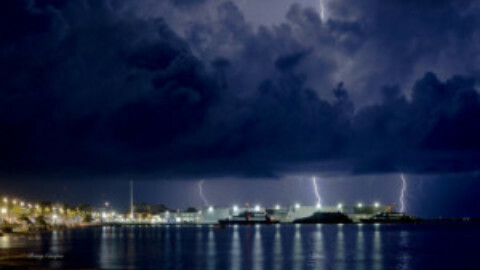 She initially made a few monthly departures to Cozumel from Miami, at $105usd for four-day cruises, before moving her home port to Port Everglades and sailing to Cozumel every Friday except the last Friday of the month for seven-day cruises starting at $120usd. She was sold again in 1972 and discontinued her Cozumel stops. Above: Newspaper article from the Voice, July 7, 1967 announcing the November 3, 1967 departure of the SS Ariadne to Cozumel. 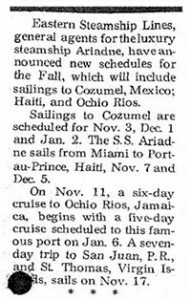 Above: SS Ariadne’s schedule October 1968 out of Miami. 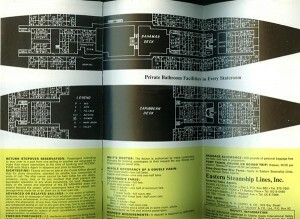 Above: The layout of the 239-passenger SS Ariadne. 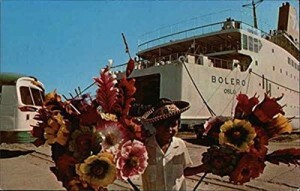 The MS Bolero called on Cozumel from 1973 to 1976. 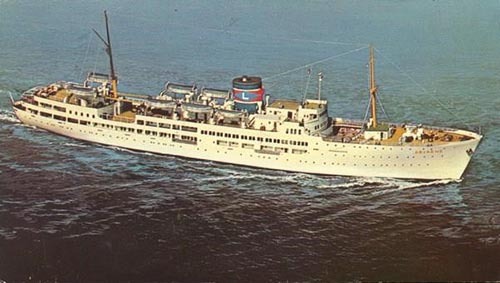 The ship was originally christened MS Prince of Fundy II in Nantes, France and commissioned in 1973 as a car/passenger ferry for traffic between Södertälje and Travemünde. In April of 1973, Commodore Cruise Lines changed the name to MS Bolero and began using the ship to make runs to Cozumel out of Miami. In March of 1974, the MS Bolero dragged anchor during a storm and went aground on the sand banks north of Cozumel. Her 354 passengers had to be airlifted to Miami. 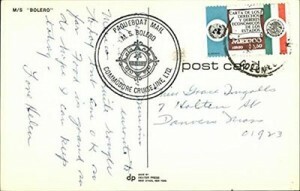 Above: Postcard of MS Bolero docked at Cozumel. In 1977, the 464-passenger MS Odessa and the 300-passenger MS Kazakhstan began carrying cruisers on trips to Cozumel from New Orleans and Tampa. Both ships were operated by the Black Sea Shipping Company of the USSR. 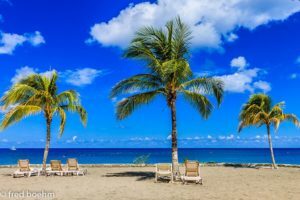 There were three cruise options for the MS Kazakhstan: A fourteen‐night “Caribbean Festival” cruise from New Orleans, calling at Cozumel, Grand Cayman, Montego Bay, Curaçao, Port‐au Prince, Santiago and Havana from $895 to $1,995; A seven-night “Blue Horizons” cruises from New Orleans, calling at Cozumel / Playa del Carmen, Grand Cayman and Havana, from $450 to $995; And a ten‐night “Venture Isles” cruise from Tampa, calling at Havana, Cozumel / Playa del Carmen, Grand Cayman, Montego Bay and Port‐au‐Prince, from $640 to $1,420. The MS Odessa cruise had two options: A seven-night “Mayan Explorer” cruise from New Orleans, calling at Cozumel/Playa del Carmen and Havana from $475 to $995 or a seven-night “Balalaikas and Bongos” cruise from New Orleans, calling at Cozumel / Playa del Carmen, Grand Cayman and Havana from $475 to $995. 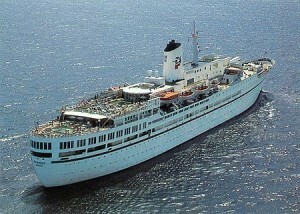 The MS Kazakhstan was built by the Wärtsilä Turku Shipyard in Finland in 1975. That is the same company that built the Wärtsilä power plant on Av. Claudio Canto (the road that ends at the SSI pier (International Pier) south of town. The MS Odessa was built by the Vickers-Armstrong shipyard as the MS Copenhagen. Later, the Black Sea Shipping Company of the USSR bought her and rechristened her the MS Odessa. Above: The MS Odessa and the MS Kazakhstan in a photo I took from the top of the Hotel Sol Caribe (today’s Park Royal) while it was under construction. Note the Soviet hammer and sickle emblem on the ships’ funnels. 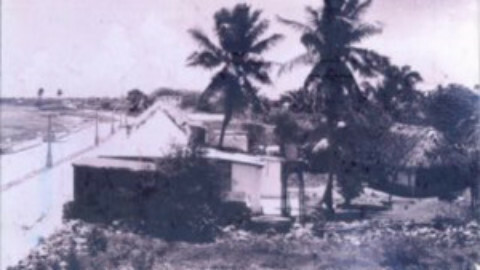 The old Hotel La Ceiba (before its tower was built and name changed to El Cid) is in the foreground. 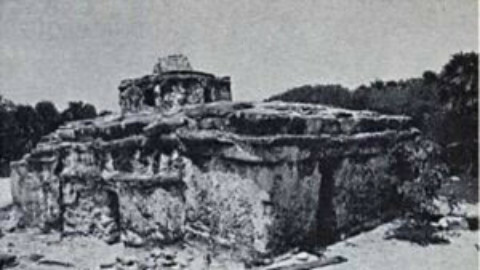 By 1978, Cozumel had established itself as an important cruise ship destination. In that year the island had six regularly scheduled cruise ships making stops: MS Renaissance, MS Vistafjord, MS Southward, MV Mermoz, SS Stela Solaris, and the SS Universe. The MS Renaissance with a capacity of 528 passengers entered service as a dual purpose vessel, ferrying passengers from Marseilles, France to Haifa, Israel, and also operating Eastern Mediterranean cruises. 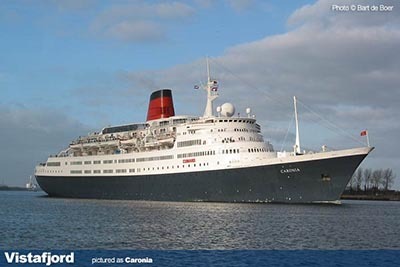 Later, the ship was renamed MS World Renaissance and made 11‐night and 10‐night cruises from Miami, calling at Port‐au‐Prince, Port Antonio, Cartagena, Panama, San Andres and Cozumel on one itinerary and at Port‐au Prince, Port Antonio, Panama, San Andres and Cozumel on the other, from $955 to $1,765. MS World Renaissance was chartered to Costa Cruises and operated by them until the early 80s. The 700-passenger MS Vistafjord made six‐night cruises from Port Everglades, calling at Montego Bay, Grand Cayman Islands and Cozumel / Playa del Carmen, from $500 to $1,010 as well as eighteen‐night cruises from Port Everglades, Cozumel / Playa del Carmen, Grand Cayman Islands, Montego Bay, Cristobal, San Blas Islands, Curaçao, Bonaire, St. Lucia and St. Thomas, from $1,570 to $3,140 and seven‐night cruises from Port Everglades, calling at Haiti, Grand Cayman Islands, Cozumel / Playa del Carmen, from $640 to $1,270. Norwegian Caribbean Lines had the 730-passenger MS Southward built in Italy as their fourth cruise ship in 1971. 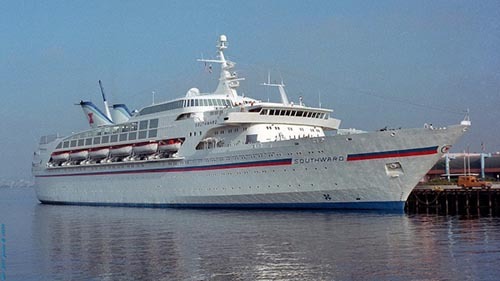 Beginning in 1978, the MS Southward departed every Saturday from Miami, calling at Cozumel, Grand Cayman Island, Ocho Rios and Bahama Out Islands, from $530 to $1,170. The MV Mermoz was built as the MV Jean Mermoz of Cie. Fraissinet of Marseille in 1958, sailing to West Africa. She was sold to the Nouvelle Cie. de Paquebots in 1965, initially retaining her name. She was later converted to be a 500-passenger cruise ship and renamed MV Mermoz. The MV Mermoz made ten‐night voyages from La Guaira to Miami, calling at Cartagena, Cristobal, Santo Tomas and Cozumel/ Playa del Carmen, from $850 to $1,660. (Rates included flight from Miami to Caracas with overnight stay in Caracas.) The MV Mermoz also made ten-night cruises from Miami, calling at Nassau, Montego Bay, Grand Cayman, Santo Tomas, Cozumel / Playa del Carmen, from $850 to $1,750. SS Stella Solaris was built in Dunkirk, France as the SS Cambodge in 1953. The ship was used to take French troops from Algeria to France after the Algerian War, was a hospital ship in the Vietnam War, and made cruises from Australian ports to destinations in the Indian Ocean. 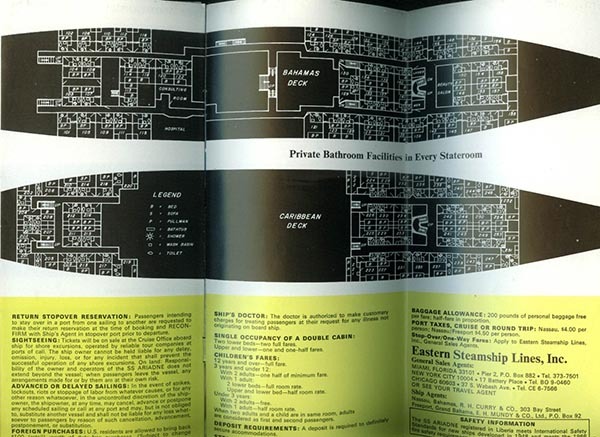 The ship was purchased by Sun Lines for conversion into a cruise ship in 1970, and room was made for 765 all first class cabins. The SS Stella Solaris made a fourteen‐night Christmas/New Year’s cruise from Galveston, calling at Montego Bay, San Juan, St. Thomas, Cartagena, Cristobal, Balboa, San Andres, Grand Cayman and Cozumel, from $1,830 to $3,375. 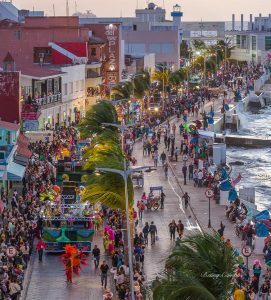 Later, it made twelve-night cruises from Galveston to Playa del Carmen, calling at Grand Cayman, Cartagena, Cristobal, Balboa, San Andres and Cozumel, from $1,960 to $2,695. The SS Universe was built as a “break bulk cargo ship” by Sun Ship Building & Dry Dock Co., Chester, Pennsylvania in 1953. The ship’s original name was the SS Badger Mariner. Later, its name change various times: It was the SS Atlantic from 1957-1971, the SS Universe Campus from 1971-1976 and finally, the SS Universe 1976-1996. The 570 passenger SS Universe made twenty‐two day voyages from Port Everglades to Los Angeles, calling at Cozumel, Puerto Barrios, Puerto Limón, Cartagena, San Blas, Balboa, Acajutla, Acapulco and Puerto Vallarta, $1,795 to $3,195. El historiador Rick Hajovsky explica los orígenes de una industria. . .
El SS Ariadne zarpó de Miami en Noviembre 3,1967 para convertirse en el primer buque que llegaría de manera regular a Cozumel. El cozumeleño Carlos Namur Aguilar era el agente consignatario en la Isla y recibió al buque cuando arribó a Cozumel el domingo 5 de noviembre de 1967 por la mañana. El buque con una capacidad de 239 pasajeros, fue armado en 1951 como trasbordador para realizar viajes entre Gotemburgo y Londres, y fue botado bajo el nombre de SS Patricia. La empresa naviera Eastern Shipping Corporation (propiedad de W.R. Lovett, el propietario de la cadena de supermercados Winn-Dixie) adquirió la embarcación y la rebautizó como SS Ariadne. Al principio efectuó algunas salidas mensuales desde Miami hacia Cozumel. Por $105 dólares estadounidenses, la travesía tenía una duración de cuatro días, zarpando de su puerto de origen hacia el Puerto de Everglades y navegando rumbo a Cozumel todos los días viernes, salvo por el último viernes del mes cuando la travesía tenía una duración de siete días por $120 dólares estadounidenses. En 1972 fue revendida y sus visitas a Cozumel se suspendieron. Arriba: Un artículo en el periódico the Voice de Julio 7, 1967 anunciando la salida del SS Ariadne hacia Cozumel en Noviembre 3, 1967. Arriba: El itinerario del SS Ariadne saliendo de Miami en Octubre de 1968. 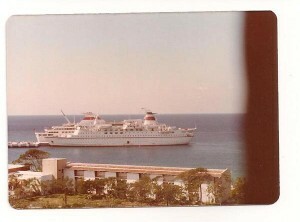 El MS Bolero llegaba a Cozumel entre 1973 y 1976. En nombre original del buque era MS Prince of Fundy II de Nantes, Fancia, y fue comisionado en 1973 como un trasbordador de automóviles/pasajeros para cubrir el comercio entre Södertälje y Travemünde. En Abril de 1973, la naviera Commodore Cruise Lines cambió su nombre al de MS Bolero y comenzó a usar el buque para hacer viajes hacia Cozumel zarpando desde Miami. En Marzo de 1974, el buque MS Bolero arrastró ancla y encalló en los bancos de arena al norte de Cozumel. Fue necesario transportar a los 354 pasajeros vía aérea hacia Miami. En 1977 el buque MS Odessa y el MS Kazakhstan con 300 pasajeros comenzaron a transportar cruceristas hacia Cozumel procedentes de Nueva Orleans y Tampa. Ambos buques eran operados por la empresa naviera rusa Black Shipping Company. El MS Kazakhstan ofrecía tres opciones: Una travesía en crucero de catorce noches, “Caribbean Festival”, zarpando de Nueva Orleans, arribando a los puertos de Cozumel, Gran Caimán, Montego Bay, Curazao, Puerto Príncipe, Santiago y La Habana desde $895 hasta $1,995. 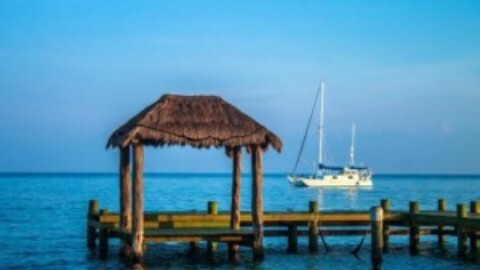 Una travesía de siete noches, “Blue Horizons”, zarpando desde Nueva Orleans, arribando a los puertos de Cozumel/Playa del Carmen, Gran Caimán y La Habana por $450 hasta $995. “Venture Isles”, diez noches zarpando de Tampa, arribando a La Habana, Cozumel/Playa del Carmen, Gran Caimán, Montego Bay y Puerto Príncipe, por $ 640hasta $1,420. MS Odessa ofrecía dos opciones: Una travesía en crucero de siete noches, “Mayan Explorer”, zarpando de Nueva Orleans, arribando a Cozumel/Playa del Carmen y La Habana por $475 hasta $ 995; o siete noches de crucero, “Balalaicas y Bongos”, saliendo de Nueva Orleans, llegando a Cozumel/Playa del Carmen, Gran Caimán y La Habana por un costo de $475 hasta $995. El buque Kazakhstan fue construido en 1975 por el astillero Wärtsilä Turku en Finlandia. Es la misma compañía que construyó la planta generadora Wärtsila que se encuentra en la Avenida Claudio Canto (el camino que termina en el muelle SSI (Muelle Internacional), al sur de la ciudad. El buque Odessa fue construido por el astillero Vickers-Armstron bajo el nombre MS Copenhagen. La empresa naviera a Black Shipping Company lo adquirió más adelante rebautizándolo con el nombre MS Odessa. Arriba: Los buques MS Odessa y MS Kazakhstan en una fotografía que tome desde la parte superior del Hotel Sol Caribe (hoy día conocido como Park Royal) mientras estaba en construccion. Observen el emblema del martillo y la hoz soviéticos en las chimeneas de los buques. En primer plano se observa el antiguo hotel La Ceiba (antes de que se construyera la torre y que cambiara el nombre a El Cid). 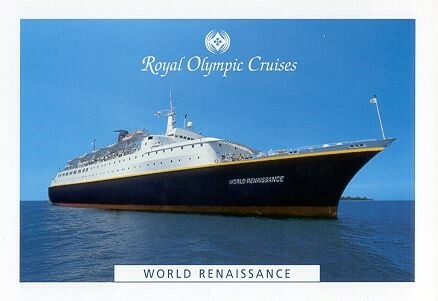 Arriba: El buque MS World Renaissance de la línea naviera Royal Olympic. Para 1978, Cozumel ya se había establecido como un importante destino de arribo de buques turísticos. En ese año, seis buques incluían dentro de sus itinerarios parar en Cozumel: MS Renaissance, MS Vistafjord, MS South Southward, MV Mermoz, SS Stela Solaris y el SS Universe. El buque MS Renaissance, con una capacidad de 528 pasajeros, entró en servicio como una embarcación con doble propósito: transportar pasajeros de Marsella, Francia a Haifa, Israel, y realizar, también la operación de travesías encrucero a través del Mederráneo oriental. El nombre del buque posteriormente camibio a MS World Renaissance, realizando travesías con una duración de 11 y de 10 noches desde Miami. Uno de estos itinerarios visitaba a Puerto Principe, Puerto Antonio, Cartagena, Panamá, San Andrés y Cozumel, en tanto que con el otro itinerario arribaba a Puerto Príncipe, Puerto Antonio, Panamá, San Andrés y Cozumel, por el precio de $955 a $1,765. MS World Renaissance fue fletado por Costa Cruises y lo mantuvieron en operación hasta comienzos de la década de 1980. Arriba: El buque MS Vistafjord de la línea naviera Norwegian. El buque MS Vistafjord con una capacidad para 700 pasajeros, realizaba travesías de seis noches zarpando de Puerto Everglades con destino a Montego Bay, las Islas Gran Caimán y Cozumel/Playa del Carmen, por $500 a $1,010, así como travesías de dieciocho noches saliendo de Puerto Everglades con destino a Cozumel/Playa del Carmen, las Islas Gran Caimán, Montego Bay, Cristóbal, Islas San Blas, Curazao, Bonaire, St. Lucia y St. Thomas, por $1,570 hasta $3,140. Asimismo, efectuaba travesías de siete noches zarpando de Puerto Everglades y arribando a Haití, Islas Gran Caimán, Cozumel/Playa del Carmen por $640 a $1,270. Arriba: El buque MS Southward de la línea naviera Norwegian Caribbean. La empresa naviera Norwegian Caribbean construyó el buque MS Southward para 730 pasajeros en Italia, siendo este su cuarto buque en 1971. Al inicio, el MS Southward zarpaba todos los días sábado desde Miami arribando a Cozumel, a la Isla Gran Caimán, a Ocho Ríos y las Islas Bahama Out por $350 a $ 1,170. Arriba: El buque MS Mermoz de la línea naviera Paquet/Sun Line. El MV Mermoz fue construido en 1958 bajo el nombre de MV Jean Mermoz de la Cie. Fraissinet de Marsella, navegando hacia África occidental. En 1965 fue vendido a Nouvelle Cíe. de Paquebots reteniendo inicialmente su nombre original. Más tarde fue convertido en un buque con una capacidad para 500 pasajeros y renombrado MV Mermoz. El MV Mermoz realizaba travesías con una duración de diez noches zarpando de La Guaira hacia Miami, llegando a Cartagena, Cristóbal, Santo Tomás y Cozumel/Playa del Carmen por un precio de $850 a $1,660. (Los precios incluían el vuelo de Miami a Caracas, pernoctando en Caracas): El MV Mermoz también efectuaba cruceros de diez noches de Miami arribando a Nassau, Montego Bay, Gran Caimán, Santo Tomás, Cozumel/Playa del Carmen, por $850 a $1,750. Arriba: El SS Stela Solaris de la línea Sun Line. El SS Stela Solaris fue construido en 1953 en Dunkirk, Francia bajo el nombre SS Cambodge. El buque fue utilizado para transportar tropas de Algeria a Francia después de la guerra de liberación argelina; también fue un buque hospital durante la guerra de Vietnam y realizó cruceros desde los puertos australianos hasta destinos en el Océano Índico. Fue adquirido por la empresa naviera Sun Lines y en 1970 lo convirtió en un buque turístico haciendo espacio para 765 camarotes de primera clase. El SS Stela Solaris realizaba travesías de catorce noches de Navidad/Año Nuevo zarpando de Galveston, arribando a Montego Bay, San Juan, St. Thomas, Cartagena, Cristóbal, Balboa, San Andrés, Gran Caimán y Cozumel por $1,830 a $3,375. Posteriormente, realizaba travesías de doce noches desde Galveston a Playa del Carme, llegando a Gran Caimán, Cartagena. Cristóbal. Balboa, San Andrés y Cozumel, por $1,960 a $2,695. El SS Universe fue construido en 1953 por Sun Ship Building & Dry Dock Co. en Chester, Pennsylvania como “buque de carga suelta”. Su nombre original fue SS Badger Mariner. Su nombre cambio posteriormente en diversas ocasiones: De 1957 a 1971, SS Atlantic; de 1971 a 1976, SS Universe Campus, y, finalmente fue llamado SS Universe de 1976 a 1996. El SS Universe con una capacidad para 570 pasajeros, realizaba viajes saliendo del Puerto Everglades hacia Los Ángeles arribando a Cozumel, Puerto Barrios, Puerto Limón, Cartagena, San Blas, Balboa, Acajutla, Acapulco y Puerto Vallarta por $1,795 a $ 3,195.